In my previous post, I explained how we can write file in OSB using file protocol. But in that case we hard-coded the file name and we may come across some requirement in that we need to set filename dynamically. 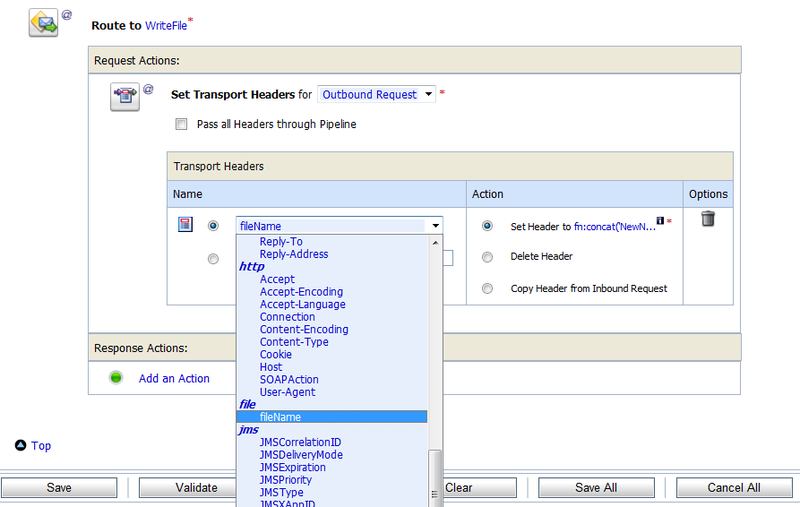 In this post, I will show you how you can change/set filename dynamically in Oracle Service Bus. To accomplish this, OSB provided one activity with the name “Transport Header”. We will use this activity to set file name dynamically. In this activity we can also add multiple headers that mean we can set multiple headers at one time. To set File name choose "fileName" under file. To set new file name click on expression in "set header to". you can new name to file name dynamically , like I simply assign input element text to file name. Make sure to put /text() at end of element to get text of that element.